A good offense is the best defense when it comes to weeds vs weedkiller. Or so it goes in Bayer Durazone's 'Hiding Bottles' by BBDO Atlanta, Mill+ and director Andrew Proctor. The project began with every plant character imaginable designed and storyboarded by the Mill+ team. 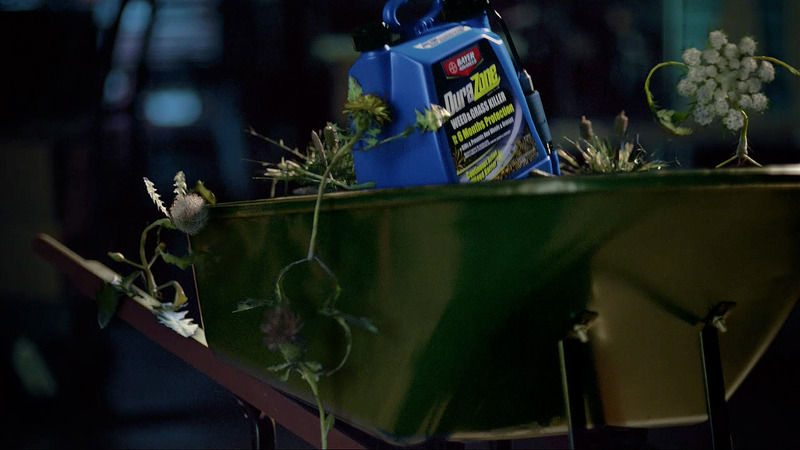 Shot over the course of one night in a hardware store, real weeds were brought on set as live action references for color and texture in midnight lighting. Each weed was given a fun name, role and personality, and then animated by hand to create the look of a weed gang with hierarchy. General Leo and his white puff of a beard, and Private Dandy sporting a bright yellow dandelion head, led the gang on a mission to hide all the bottles of Bayer Durazone inside wheel barrows, plumbing and behind garden gnomes. Hopefully the weeds don't find the plant food… or the store's staff might discover a singing dandelion straight out of little shop of horrors. Feed me, indeed!